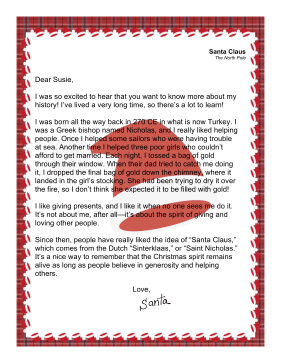 Give kids a history lesson with this letter from Santa about the origins of St. Nicholas. I was so excited to hear that you want to know more about my history! I've lived a very long time, so there's a lot to learn! I was born all the way back in 270 CE in what is now Turkey. I was a Greek bishop named Nicholas, and I really liked helping people. Once I helped some sailors who were having trouble at sea. Another time I helped three poor girls who couldn't afford to get married. Each night, I tossed a bag of gold through their window. When their dad tried to catch me doing it, I dropped the final bag of gold down the chimney, where it landed in the girl's stocking. She had been trying to dry it over the fire, so I don't think she expected it to be filled with gold! I like giving presents, and I like it when no one sees me do it. It's not about me, after all—it's about the spirit of giving and loving other people. Since then, people have really liked the idea of "Santa Claus," which comes from the Dutch "Sinterklaas," or "Saint Nicholas." It's a nice way to remember that the Christmas spirit remains alive as long as people believe in generosity and helping others.